Both Dodge City and Liberal fielded different lineups Sunday night. Dodge City had more players available to play than they did Friday night. Liberal is trying to give everyone a chance to show what they can do as the team didn’t have non league games this season. The result was a 6-1 Dodge City win over Liberal Sunday night at Brent Gould Field. Panhandle State’s Sam Beattie was solid on the mound but Liberal struggled defensively. Only two of Dodge City’s six runs were earned. The Bee Jays had three errors. The A’s scored two unearned runs in the first. They added a run on two singles in the fifth. The Bee Jays threatened in the fifth when Cale O’Donnell singled home a run. Runners were on second and third when Liberal struck out looking to end the inning. The A’s quickly scored three in the sixth. One run was earned. Beattie went 5 and 2/3 allowing six runs but two earned. Zach Zeller pitched 2 and 1/3 scoreless and Lowell Schipper went one scoreless. Dodge City had three players in their lineup from North Dakota State who weren’t with the team Friday. Liberal used four different players in their lineup as compared to Friday. 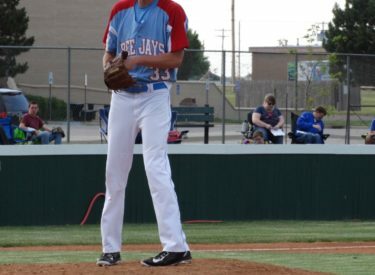 Both teams are 1-1 in the Jayhawk after Saturday in Dodge City was rained out. Liberal hosts a free youth clinic Monday 10-12 in Perryton. The BJ’s host the Derby Twins Tuesday, Wednesday, and Thursday night at 7 on 1270 and kscbnews.net. The Leader and Times is the buyout sponsor for Tuesday night’s game.